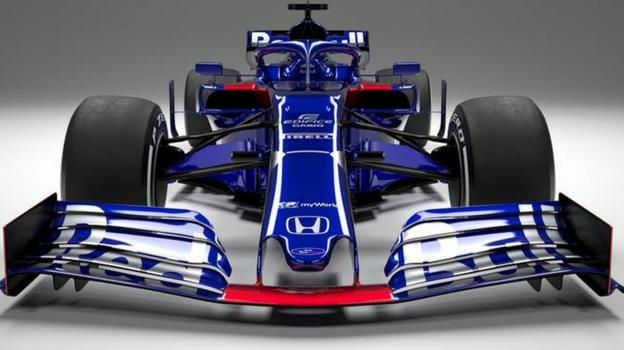 Toro Rosso have unveiled their 2019 Formula 1 car, saying it owes a lot to last year's Red Bull. Team boss Franz Tost said he did not want to set any targets for Toro Rosso but Honda's F1 technical director Toyoharu Tanabe said Red Bull's engine partner was aiming to "achieve better results than in 2018 for both teams". Toro Rosso finished ninth in the constructors' championship last year and achieved a best result of fourth place in the Bahrain Grand Prix thanks to Pierre Gasly. Tost said the new Toro Rosso, called the STR14, features a lot of parts bought from Red Bull that were on the car which finished third in the constructors' championship and took four wins. F1 rules require only that teams design and build their own chassis and major aerodynamic surfaces. All other parts - such as suspension and gearbox - can be bought from another team. Tost said the new arrangement - which Toro Rosso last used in 2008, when it effectively had an entire car from Red Bull before that practice was banned - would "leave more time for our technical working groups to focus more on the details". The new car features the wider front and rear wings that have been mandated this season by F1's rule-makers in an attempt to make the racing closer by allowing cars to follow each other more easily. Tost said: "Daniil showed his natural speed from the very beginning. When the contingency required his move to Red Bull Racing, it seemed he could be ready for the challenge. "He showed some very good performances but to perform under pressure is always a challenge, now we can say with hindsight it was just too early. "He had to live through a difficult time when he joined us again in 2016 - it was psychologically tough, but no one has ever doubted his driving skills. I strongly believe he deserves another chance in Formula 1." Kvyat, who spent a season as a Ferrari development driver last year, said: "Let's just say it's great to be back and it proves you should never give up hope. "I don't want to say whether I've changed or not. I know there's been a lot of speculation about this and whether I've matured or not and so on, but I prefer to let my driving on the track answer. I just want to get in the car and see what happens." Albon, who finished third in the Formula 2 feeder series last year, said: "I'll try not to put too much pressure on myself and give it everything I have from day one. It's my opportunity this year to show everyone what I've got." Albon, who was born in London, said: "It's a big deal for me to be a Thai driver. It's been a long time since there's been a Thai in Formula 1 and I'm just hoping to do everyone proud." He added: "I never set any goals on anything. Every year, it was just each race, take it step by step, focus and race in that session - whatever it would be, practice, qualifying, the race. Just take it as it is. "If you start setting long-term goals, you just put unnecessary pressure on yourself. I'm just focused on myself and let's see how it all goes."